To celebrate the winter clock-change and the transition to riding on darkened streets, the Bicycle Alliance of Washington invites you to take part in a special ride. The Get Lit ride is to promote the importance of safe nighttime riding and the use of lights and conspicuous clothing. To help ensure that all riders have access to front and rear lights, the Bicycle Alliance will donate lights to a number of organizations to distribute to their members. The alliance invites bicyclists to take part in the free Get Lit ride November 5 in Seattle. Riders will meet at Bikestation Seattle at 4:30 PM. After a brief discussion of safe night cycling, riders will ride as a group to the Union Gospel Mission, The Salvation Army, Plymouth Housing Group, Goodwill and Bike Works. At each of these locations bicycle lights will be delivered to be distributed at no cost to low-income cyclists. These lights have been provided by the Bicycle Alliance of Washington's Get Lit program as part of an ongoing effort to improve road safety for all cyclists in Washington. Major funding for this program has been provided by attorney John Duggan, individual donors and Bicycle Alliance income from the Washington State Share The Road license plates. All riders must register at the start of the ride and have lights, reflective gear and a bicycle helmet. An award will be given for the best-lit cyclist and the most creatively lit cyclist. All riders will receive reflective stickers. Hot cider will be provided at the end of the ride. Start: BikeStation Seattle, 311 3rd Avenue South. I've been using a couple of Planet Bike headlights lately and I think the above picture conveys some useful information. The light on the left is the Planet Bike Beamer 3 . This little light runs on 2 AA batteries, comes with a nice handlebar bracket and so far seems quite waterproof and well-built. The light on the right is the Planet Bike Blaze . The Blaze is slightly larger than the Beamer 3, seems similarly well-built and comes with both a handlebar and a helmet bracket. Like the Beamer 3, it also runs on 2 AA batteries. Planet Bike lists both lights have having run times of "up to 100 hours". In practice, I've been running both lights with NiMH rechargeable AA batteries and I usually remember to charge them up about once a week or so. Depending on when I go to work, that means I may have logged a dozen hours of night riding in that week. For me, any light that can get me through a solid night of riding has a long enough battery life. Basically the difference in the two lights comes down to beam pattern and price. I'd expected to prefer the pricier Blaze. As you can see from the above photo (shot in normal office light BTW) the Blaze has a stronger, more focused beam. The Beamer 3, which has three lower-powered LEDs compared to the Blaze's single 1/2 watt LED, has a more dispersed beam. The Blaze lets me see further down the road, while the Beamer 3 gives a broader view. Now here is where I should put in the disclaimer that I have very good night vision. Some of my friends claim that I can see in the dark and while that isn't strictly true, I am comfortable with lower powered lights than what many of my rando buddies use. I'm happy to navigate my commute with either of the two lights above, but my favorite set-up is what I have on my green bike right now: I have both a Blaze and Beamer 3 on that bike. On my little red Dahon, I've ridden the commute with a just Beamer 3 but I think I prefer the further reaching Blaze. Compared to my other favorite light, the Princeton Tec EOS , the light output of the Planet Bike lights is right on par. The beam of the EOS is probably about halfway between that of the Beamer 3 and the Blaze. The EOS has various power settings and more sophisticated circuitry,but the later generation LEDs and good optics of the Planet Bike lights seem to make very good use of the power they have. The EOS is super weather-proof, but the fact that it takes an odd number of AAA cells is still a little bothersome. The EOS and the Planet Bike lights can both be set to either flash or solid modes, but I find the faster flash rate of the Planet Bike lights to be better for riding. 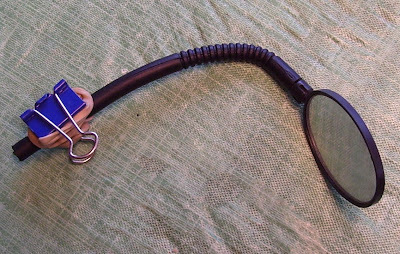 Planet Bike has sent me fenders and nifty beanie in the past and they gave the Bicycle Alliance a good deal on Beamer 3 and Blinky 3 lights for our "Get Lit" program, but I've spent my own hard-earned bucks on the lights in this review. But I guess I am kind of pre-disposed to think favorably of a company like Planet Bike that not only makes good stuff, but also gives 25% of their profits to causes that promote and facilitate bicycle usage. Awhile back I wrote about Reelights. While they pretty much work as advertised, I've discovered one interesting incompatibility; the front Reelight conflicts with the bike racks at the Seattle Bike Station where I work. At first I noticed that the light would bonk into the rack when I'd park. Sometimes it would get knocked out of alignment enough that it would be moved too far away from the wheel magnets to blink. Later, I noticed that the light started making a ticking noise every time the magnets would move past it. I surmised that the jarring knocked the inner coil loose. The ticking was the coil shifting each time the magnets tugged at it. Eventually I parked one too many times and I broke the front light. The case popped open and the internal parts fell out. The good news is that I got some pictures. The coil attaches to the circuit board with incredibly tiny wires. I don't think I'm going to bother with reassembling the circuit and I'm going back to using a front LED light powered by rechargeable NiMH batteries. Digging around in my pre-blog archives, I came across this. I thought you folks might enjoy it. As I have said many times, I am not a nutritional role model. Nonetheless, it seems these days that almost everyone has written a diet book or is pushing some low-something lifestyle and I got to thinking I should cash in on the action. But cashing in on things has never been one of my strong suits. People ask me how I manage to eat all kinds of stuff and stay thin, so I wrote my diet book. It came out a bit on the short side. The seventeen syllable short side to be precise about it. Hmm, that hardly seems worth shopping around to a publisher. There you go. If the plan doesn't work for you, gee that's too bad but you can't say you didn't get your money's worth. And in the haiku where it says "ride" it means "ride your bike" but you folks know that. and I'll fill you in on the ins and outs of getting around this part of the world by foot and bike. On Saturday, October 13th, 2007, my friend Mark Canizaro loads his bike on a bus in the Seattle morning fog and rolls east to find Issaquah bathed in warm sunlight. The pines and the cedars are still green, of course, but the cold nights and shortening days have cued the maples, dogwoods, oaks and others to color their leaves in shades of red and gold. Our nominal goal today is the Black Diamond Bakery but our route is more meander than mission. Our bike tires ultimately spin out fifty-two miles on mostly quiet roads and leaf-strewn trails. Snakes enjoy the sun and salmon work their way up the Cedar river. Mark and I explore and eat and eventually wander home. Soon the rains winter rains will begin in earnest. The salmon carcases and leaves will wash downstream, the snakes will sleep away the winter. Bike commuters, like Mark and myself, will layer wool under yellow rain jackets, turn on our lights for both the morning and evening commutes and tell lies like "there is no bad weather, only bad clothing." But we'll remember there are days, days in October when the air is crisp and the light is golden, when it is hard to imagine why anyone would ever want to live anywhere else. Today is Blog Action Day and bloggers all over the world are posting things about the environment. I often write about big bike trips or bike safety or the latest bikey gadget I've found but today I'm going to talk about short trips. Trips less than 2 miles. 40% of US urban travel is two miles or less. Now I'm fond of saying that "any distance is biking distance" but not everybody goes out for 50 mile rides for fun or thinks 18 miles is just about the perfect distance for a bike commute. But two miles? Lots of folks can walk or bike two miles. have tools that help you see what's within a short walk or bike ride of a given address. Since Christine and I gave up our cars over 20 years ago, we've always been very conscious of the walkability of the places we've lived. We used to plot out circles on paper maps but these days the web puts that kind of info at your finger tips. Some times we do big things that make a big difference. But often it's the little things we do, over and over, that make a big difference. Maybe one of those things can be using our own power to go to the market or the library or the post office. Small steps can make a big difference. I continue to be very pleased with my Dahon Curve D3. I've pretty much got the bike dialed in now. The pictures show how the bike folds and what I'm using for luggage. I also added bar-ends, lights and a bell to the bike and for better wet-weather braking, I upgraded the brakes with Koolstop Salmon brake pads. The bike rides really well. Having the bag up front doesn't seem to bother the handling but like most folders, the D3 is not a bike I can ride no-handed. Single-handed riding is fine, however. The Schwalbe Big Apple tires are great, I've ridden them on rough roads and gravel paths and they are plenty comfy. Speaking of comfy, the stock saddle is cushier than what I usually ride but it seems right for this bike. I'm quite upright on the bike but I've already logged some fifty mile days on the bike and I still like the saddle. The Dahon is such a kick to ride, I'll probably ride a century on it before too long. A while back I found a little mirror on the shoulder of the Sammamish Parkway. The stick-on helmet mount had obviously not been up to the job so I got to thinking about a way to put my road find to use. I clipped off the faulty mount and replaced it with an office binder clip and a couple of rubber bands. I always wear a cap under my helmet so I clip the mirror to my cap brim whenever I go for a ride. 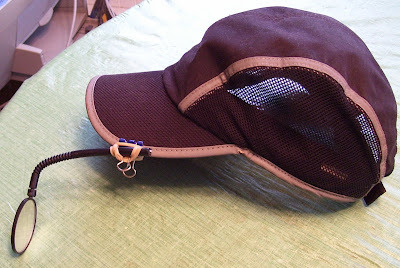 BTW, the cap in this picture is an REI runner's cap and the trim is very reflective. You can see the cap reflecting the flash from Tarik's camera here. And yeah, I know it looks dorky. I made my peace with being a dork a long time ago.